Copyright (c) – Viacom International Inc. Licensed From – Island Records Inc.
Record Company – PolyGram Group Distribution, Inc. Produced For – Trackmasterz Productions, Inc.
A&R [A&R Coordination] – Sean C.
Tracks 2 and 21 [published by] Pebbitone Music / Left Eye Music (administered by Pebbitone Music) / American Music (administered by Bean Tribe Music) (ASCAP). Produced for Graffiti Entertainment. Recorded and mixed at Darp Studios, Atlanta, GA. TLC appears courtesy of LaFace Records. Track 4 [published by] Zomba Songs, Inc. / Hookman Music (BMI) / Zomba Enterprises, Inc. / Fe-Mac Music (ASCAP). Recorded at Paramount Recording Studios, CA. Mixed at Enterprise. Immature appears courtesy of MCA Records, Inc. Smooth appears courtesy of Perspective Records. Track 6 [published by] Human Rhythm Music (BMI) / Young Legend Songs / Ecstasoul Music (ASCAP). Produced and arranged for Human Rhythm Productions. Recorded at Human Rhythm Studios. Mixed at Sound Castle Studios. Brandy appears courtesy of Atlantic Records. Track 8 [published by] T-Boy Music / Boo Daddy Publishing / Portrait-Solar Songs, Inc. / Circle L Publishing (ASCAP). Sample of "Fantastic Voyage" by Lakeside used courtesy of Solar Records. Coolio appears courtesy of Tommy Boy Records. Track 10 [published by] Mokenstef Music / WB Music Corp. / All In It Muzic / Ma'Phil Publishing (ASCAP) / Rubberband Music / Saja Music Co. / Songs Of PolyGram International / Songs Of Lastrada (BMI). Produced for Strictly Old School Promotions. Recorded at Kiva Recording, Encino, CA. Mixed at Skip Saylor, Hollywood, CA. MoKenStef appears courtesy of Outburst Records. Track 12 [published by] EMI April Music, Inc. / Soul On Soul Publishing, Inc. / WB Music Corp. / Jevelle Music Publishing / Jumping Bean Songs, L.L.C. (ASCAP) / Twelve And Under Music (BMI) / Jelly's Jam's, L.L.C. / Slam U Well (ASCAP). Contains samples of "Check The Rhyme" performed by A Tribe Called Quest, courtesy of Jive Records, [published by] Zomba Enterprises, Inc. (ASCAP) / Joe's Songs (ASCAP). Contains samples of "Mr. Magic" performed by Grover Washington, Jr., courtesy of Motown Records Company, L.P. under license from PolyGram Special Markets, a division of PolyGram Group Distribution, Inc., [published by] Antisia Music, Inc. (ASCAP). Produced for Trakmasterz Productions Inc. ℗ 1994 MCA Records, Inc. Courtesy of MCA Records, Inc. 9/7/94. Soul For Real appears courtesy of MCA Records, Inc.
Track 14 [published by] Zomba Songs, Inc. / R. Kelly Publishing Inc. (administered by Zomba Songs, Inc.) (BMI). Engineered at Chicago Recording Company. Pre-production at Battery Studios. Aaliyah appears courtesy of Jive Records. Track 16 [published by] Naughty Music / WB Music Corp. (ASCAP). Contains a sample from "Eric B Is President", performed by Eric B. & Rakim, published by Songs Of PolyGram International Inc., used courtesy of Island Records, Inc. and "I Thank You", performed by Sam & Dave, published by Walden Music, Inc. / Almo Music Corp., all rights administered by WB Music Corp. (ASCAP), by arrangement with Warner Special Products, Inc. Recorded at Marion Recording and Soundtrack. Naughty By Nature appears courtesy of Tommy Boy Records. Track 18 [published by] Chyna Baby Music / Janice Combs Publishing, Inc., administered by EMI Blackwood Music Inc. (BMI) / Ninth Street Tunnel Music (BMI) / Justin Publishing, Inc., administered by EMI April Music Inc. (ASCAP). Produced for Chuck Life Productions, Inc. / Bad Boy Entertainment, Inc. and for Bad Boy Entertainment, Inc. Recorded at The Hit Factory and at Daddy's House Recordings. Mixed at The Hit Factory. Faith Evans appears courtesy of Bad Boy Entertainment / Arista Records. Track 20 [published by] Zomba Songs, Inc. / Hookman Music / Rickidy Raw Music (BMI) / Zomba Enterprises, Inc. / Fe-Mac Music (ASCAP). Sample from "Girl Callin'" performed by Chocolate Milk under license from The RCA Records Label of BMG Music. Produced for Hook Productions and for Rickidy Raw Productions, Inc. Recorded at Westlake Studios, Los Angeles, CA and Horizon Studios, Capitol Heights, MD. Mixed at Larrabee North Studios, North Hollywood, CA. Immature appears courtesy of MCA Records, Inc. Smooth appears courtesy of Perspective Records. Nickelodeon, All That and all related titles, logos and characters are trademarks of Viacom International Inc. ℗ 1996 Vicaom International Inc. © 1996 Viacom International Inc. Manufactured and distributed by BMG Distribution, a unit of BMG Entertainment. Printed in USA. 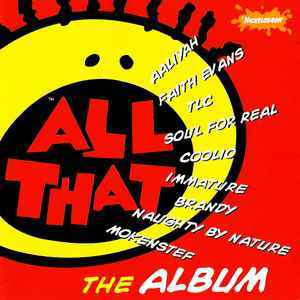 Tracks 1, 3, 5, 7, 9, 11, 13, 15, 17 and 19 are dialogue snippets from the television show "All That" on Nickelodeon. There is no information listed for these tracks.